I guess you must have kept a mass of media files like songs, videos, audios, photos on your iPad. However it's a pity that iOS device doesn't include SIM card slot so there's no way to extend the phone memory. Then you might need to transfer part of the music or large size media to computer to free space for your iPad. iTunes is absolutely an annoying program since it doesn't meet all user's need. What other tool you can apply to selectively migrant music from iPad to computer? Myjad TransPhone is a newly-developed iOS data managing software enables you to transfer songs, videos, photos, iTunes U, iBook, applications, TV shows etc. from/to iPhones, iPad, iPod, computer folder and iTunes. 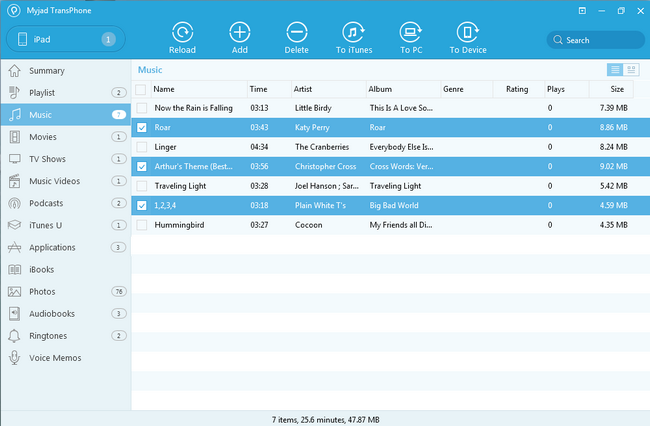 TransPhone contains a unique playlist management feature that you could utilize it to create, add, edit and delete playlists on your iOS device and iTunes library. Download the trial version of TransPhone and follow the guide below to export iPad music to computer directly. TransPhone is quite a simple and user-friendly program that even a fresh user could understand how to operate. If you are still not sure how to transfer music from iPad to computer, here is a hint for you. After downloading the TransPhone on computer, the main interface of program will pop up automatically when you connect the iPad to computer. The major interface of TransPhone looks as the below image. You will see your device's name on top of the menu bar if it's successfully connected with the computer. And the picture of iPad is on the middle of window and the details of it are next to the image, such as name, type, color, battery, iOS version, etc. Since we are demonstrating iPad music to computer, click on "Music" on the left side column then select songs that you wish to migrate to computer. You can either transfer by hitting "to PC" function key or just right click the mouse to proceed with data migration. The process of migrating will be last a short time. As you can see the current process and the overall process will tell you how long and how many files will you take clearly. After finishing all of them, then you can confirm these songs on computer at will. 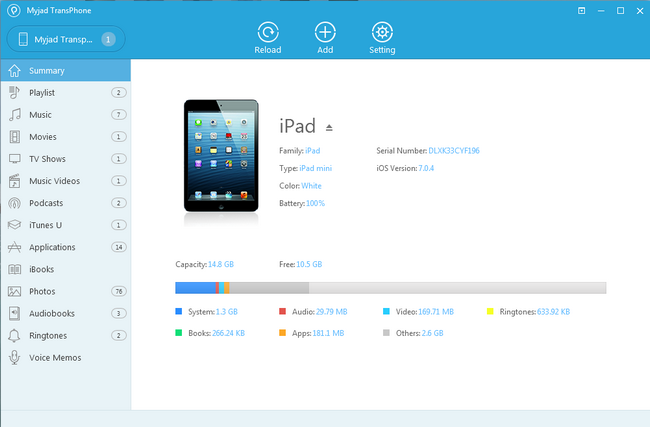 Or if you want to transfer music, videos and photos from computer to iPad, iPhone to iPod, iPad, iPhone to iTunes etc., TransPhone allows you to do so as well. TransPhone speeds up the transfer process that it takes only about 20 minutes to export 5000+ songs. Now try and experience this fantastic program.